If you haven’t heard of her already, there is a remarkable lady called Kate Swaffer. She is, as she puts it in her twitter biography, an advocate for people with dementia, living well with young onset dementia, a speaker, author, poet, blogger, chef, wife, mother and friend. And it’s true – Kate and many other people with dementia are making themselves heard online in different ways. The first time I heard of Kate was on twitter, talking with other people who have a strong interest in dementia. I would never have known about Kate otherwise – she lives in Australia for a start. As she demonstrated so well when addressing the representatives of 80 countries, she has a unique contribution to make because of her lived – and living – experience of dementia, both as a carer and as someone with a dementia diagnosis. 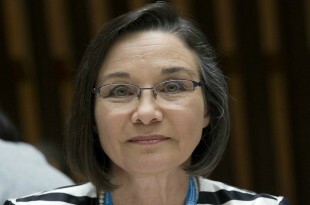 And when you don’t have the chance to hear her at an international event, you can gain that perspective on her blog kateswaffer.com and by joining more than 2,200 people who already follow her on twitter (@KateSwaffer). And this is why digital engagement matters – because it gives us access to people who have something to say, people who are directly affected by what governments do at an international, national and local level. People we might not hear from otherwise. People who need to be heard. Thank you, Kate. How good to hear somebody speaking non-jargon English on any subject, let alone a tricky one such as dementia. Lang may yer lum reek! Glad you have tackled this subject Kate, my mum has dementia. It is indeed complex. However she is 90 now and does well. She is forgetting more and more and more quickly, but amazingly she remembers some things, like when I took her to a guitar shop the summer before last, and she still rmembers, I think because it was different to the usual routine and she loved it. So I hope research will be well funded in future, I am sure there is an answer.